The Indian Mahasiddha Tilopa (988-1069) was the first guru of the Indo-Tibetan Mahamudra lineage, who received this profound transmission directly from the 'Primordial' or dharmakaya Buddha Vajradhara. 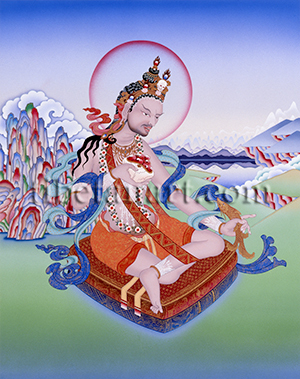 Born as a Brahmin in Eastern Bengal, Tilopa chose to enter the Buddhist Academy of Somapuri as a monk, where he received initiation into the Chakrasamvara Tantra through the direct visionary transmission of a dakini who was a manifestation of Vajrayogini. However, after taking a courtesan as his wisdom-consort he was expelled from Somapuri, and having exchanged his monastic robes for those of a beggar he began studying under other great itinerant India siddhas while he earned a living from pounding oil out of sesame seeds (Skt. til). Tilopa later combined these received teachings into four "Oral Instruction Doctrines” that focus upon the esoteric tantric practices of: illusory-body yoga, dream yoga, the yoga of clear light, and the yoga of inner heat. Tilopa is shown here wearing the loincloth, meditation belt, and bone ornaments of an Indian mahasiddha, and holding a nectar-filled skull-cup, and a golden fish as a symbol of spiritual transformation.